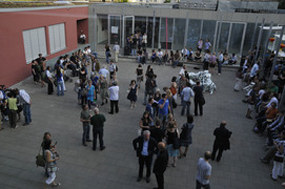 Academy of Media Arts Cologne— annual exhibition 2010 of films, concerts, performances :: July 15 – 18, 2010 :: Opening: July, 15; 6:30 pm :: Filzengraben 2, D-50676 Cologne, Germany. The Academy of Media Arts Cologne (KHM), inaugurated in 1990, offers an educational concept that cross-links and integrates the fields of Film, Art and Theory in one single degree course titled “Audiovisual Media”. This is unique in Germany and contrasts with the traditional academic class or master student principle of art academies and other art schools where study courses are divided into classes or subjects. The curriculum promotes an interdisciplinary and multifaceted involvement with media arts. Stage One provides elementary theoretical and artistic knowledge during three semesters. Stage Two as well as Postgraduate Studies give each student the opportunity to specialise in disciplines ranging from, for example, photography, feature film, documentary and experimental film, camera, animation, video and light art, design, sound, scenography, experimental informatics, sculpture, art in public space and architecture to theory, aesthetics and the history of machines, the arts and the media. Student work is project orientated and takes place in workshops, studios and labs, accompanied by lectures and seminars that convey the historical and theoretical basics of media arts. The KHM has on average 330 students a year, who are intensively tutored by an international team of professors and colleagues, as well as by a network of fellows and guest lecturers. The ongoing collaboration with national and international academies, cultural institutions, festivals, exhibition organisers, as well as the media and film industry promotes and enhances the teaching.